The Website consists of both publicly and privately accessible areas. Publicly accessible areas are those that are intended to be available to the general public. Privately accessible areas on the Website require authentication and authorization via user identification and passwords. Privately accessible areas may be further restricted requiring additional user identification and passwords and adherence to separate terms and conditions set forth in relevant agreements of non-disclosure or confidentiality. Access to the Website does not confer any license or ownership interest in either the form or content of the Website, including any confidential or proprietary information or intellectual property of any kind or nature, and RF hereby expressly reserves such rights and property in its entirety. RF may change or discontinue any portion, feature, or content of the Website at any time with or without notice to you. RF assumes no responsibility for any material (e.g., information, data, text, software, graphics, etc.) posted by third parties on the Website or accessed on the Website through hypertext or other computer "links" to sites hosted by third parties that are outside of RF's control. 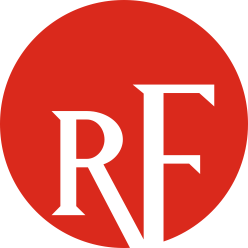 RF does not endorse products, services, or information provided by third parties and shall not be responsible or liable, directly or indirectly, for any damage or loss caused or alleged to be caused by or in connection with, use or reliance on any content available on or through any third party site or otherwise posted by third parties on the Website. Further, the inclusion of links to third party websites on the Website does not imply that the owners of such third party websites have given permission for inclusion of these links, or otherwise sponsored or endorsed RF's Website. RF is not responsible for the accessibility of third party websites via the Website. Should you discover that a third party link on a webpage is broken, no longer pointing to the content so indicated on the Website, or points to a third party website containing infringing content, malicious code, or any offensive, libelous, or otherwise illegal or inappropriate content, please email RF using the form on the "Contact Us" page. To ensure RF can quickly respond to the issue, your email should include the originating RF page URL, the linked page URL and a description of the content in question. To access privately accessible areas of the Website you will need a valid login account(s). Your account's credentials consist of a username and password. You are responsible for maintaining the confidentiality of your credentials and are fully responsible for all activities that occur through the use of your credentials. You agree to immediately notify RF of any unauthorized use of your account or any breach of security, and ensure that you logout of your account at the end of each session. RF cannot and will not be liable for any loss or damage arising from your failure to comply with this section. You agree that all RF trademarks, service marks, and other RF logos are trademarks and property of RF (the "RF Marks"). You agree not to display or use in any manner the RF Marks without RF's prior written permission. 5.1. The Website may provide functionalities for users to upload, download, or post comments, ideas, articles, information, data, text, software, graphics, messages, and other materials or submissions ("End-User Content"). The views and opinions expressed therein do not necessarily reflect those of RF. The end user who posted the End-User Content is solely responsible for such End-User Content. 5.2. RF does not guarantee the accuracy, integrity or quality of End-User Content and disclaims all liability for any errors, omissions, violation of third party rights or illegal conduct arising from End-User Content posted, emailed, or otherwise transmitted via the Website. 5.3.7. that undermines the purpose of the material on the Website and the course with which it is used, including but not limited to promoting the reliability of the bulk power system. 5.4. You acknowledge that RF does not pre-screen End-User Content. RF reserves the right (but not the obligation) in its sole discretion to monitor, refuse to post, or remove any End-User Content for any reason. RF reserves the right to terminate your access to the Website to prevent further posting of prohibited End-User Content. 5.5. You acknowledge and agree that RF reserves the right to preserve End-User Content indefinitely in the event of a potential violation of these terms or dispute pertaining to End-User Content. You acknowledge and agree that RF further reserves the right to disclose End-User Content in association with your contact and/or personal information if required to do so by law or in the good faith belief that such preservation or disclosure is reasonably necessary to: (a) comply with legal process; (b) enforce the terms of service hereunder; (c) respond to claims that any End-User Content violates the rights of third-parties; or (d) protect the rights, property, or personal safety of RF, its users and the public. 6.12 .intentionally, or unintentionally, violate any applicable local, state, national, or international law. The Website uses browser cookies to facilitate easier navigation within the site and provide a higher level of convenience for the visitor. A cookie is a small piece of information about an Internet session that may be created when a visitor accesses a website. RF will not disclose personally identifiable information via the publicly accessible areas associated with your use of the Website (e.g., name, email address, physical address, username and password, activity results, etc.) to any third parties not affiliated with RF, except in the event of suspected illegal conduct, such as misappropriating password access, violating the terms of this Agreement. Personally identifiable information may be disclosed to law enforcement officials in order to facilitate the investigation of such allegations. 9.1. In obtaining private access to the Website under this Agreement, you certify to RF that: (a) the information you have provided to RF in order to register as an end user is complete, accurate and current; (b) you will notify RF immediately of any change in your registration information; (c) you will not share your login username; and (d) you will timely update your password as required. 9.2. If any of these certifications is or becomes untrue, or if you do not comply in full with these requirements, RF has the right to suspend and/or terminate your access to the Website. 9.3. You are also responsible for obtaining and using all computer hardware and software required for your access to and use of the Website. 9.4. You are responsible for all uses of the Website through your login username and password, whether the use is made by you personally or by someone else. You are responsible for protecting and securing your username and password from unauthorized use and disclosure. In the event that you become aware of or believe there has been any breach of the Website, such as the theft or unauthorized use of your login username and password, you will notify RF immediately by using the form on the "Contact Us" page. 10.1. You may terminate your private access rights to use the Website at any time and without cause by notifying RF of your decision to terminate. See Section 15 for details. 10.2. RF may, in its sole and absolute discretion, and with or without notice, suspend or terminate your private access to all or any part of the Website, or terminate this Agreement and thus your rights to use the Website, for any conduct or use (whether by you or anyone else having access under your login username or password) that RF believes is a violation of the Agreement or for any other conduct or use that RF believes is harmful to other end users, RFs content providers, the Website, or the interests of RF. 11.1. RF's entire liability to you, and your sole and exclusive remedy, regarding the private access use of the Website shall be the replacement of a login username or password if a currently valid login username or password fails to allow access to the Website. 11.2.Your sole right with respect to any disagreement or dissatisfaction with (a) the Agreement, as modified from time to time; (b) access to, use of, or performance of the Website; or (c) any Website Content, is to terminate your access as provided for in Section 10. YOUR USE OF THE WEBSITE IS AT YOUR OWN RISK. THE WEBSITE AND ALL WEBSITE CONTENT ARE PROVIDED ON AN "AS-IS," "AS-AVAILABLE" BASIS WITHOUT ANY WARRANTIES OF ANY KIND, EITHER EXPRESS OR IMPLIED, BY OPERATION OF LAW OR OTHERWISE. RF DISCLAIMS ALL WARRANTIES, INCLUDING ANY IMPLIED WARRANTIES OF MERCHANTABILITY, FITNESS FOR A PARTICULAR PURPOSE, TITLE, OR NON-INFRINGEMENT. RF DOES NOT WARRANT THAT THE FUNCTIONS OR WEBSITE CONTENT WILL BE UNINTERRUPTED OR ERROR-FREE, THAT DEFECTS WILL BE CORRECTED, OR THAT THE WEBSITE OR THE SERVER THAT MAKES IT AVAILABLE ARE FREE OF VIRUSES OR OTHER HARMFUL COMPONENTS. RF DOES NOT WARRANT OR MAKE ANY REPRESENTATION REGARDING USE, OR THE RESULT OF USE, OF THE WEBSITE CONTENT IN TERMS OF ACCURACY, RELIABILITY, COMPLETENESS, TIMELINESS, AVAILABILITY, OR OTHERWISE. THE WEBSITE CONTENT MAY INCLUDE TECHNICAL INACCURACIES OR TYPOGRAPHICAL ERRORS, AND RF MAY MAKE CHANGES OR IMPROVEMENTS AT ANY TIME. YOU, AND NOT RF, ASSUME THE ENTIRE COST OF ALL NECESSARY SERVICING, REPAIR OR CORRECTION IN THE EVENT OF ANY LOSS OR DAMAGE ARISING FROM YOUR USE OF THE WEBSITE OR WEBSITE CONTENT. RF MAKES NO WARRANTIES THAT YOUR USE OF THE CONTENT WILL NOT INFRINGE THE RIGHTS OF OTHERS AND ASSUMES NO LIABILITY OR RESPONSIBILITY FOR ERRORS OR OMISSIONS IN SUCH CONTENT. UNDER NO CIRCUMSTANCES, INCLUDING, BUT NOT LIMITED TO NEGLIGENCE, SHALL RF, NOR ANY OF ITS SUBSIDIARIES, AFFILIATIES, LICENSORS, SERVICE PROVIDERS, CONTENT PROVIDERS, EMPLOYEES, AGENTS, REPRESENTATIVES, OFFICERS, OR DIRECTORS, BE LIABLE TO YOU OR ANYONE ELSE FOR ANY DIRECT, INDIRECT, GENERAL, SPECIAL, INCIDENTAL, PUNITIVE, EXEMPLARY, CONSEQUENTIAL, OR OTHER DAMAGES (INCLUDING DAMAGES THAT ARISE FROM LOSS OF ANTICIPATED REVENUE, LOSS OF INFORMATION OR MATERIAL OF ANY KIND, LOST PROFITS, LOSS OF BUSINESS, AND INJURY TO PROPERTY, EVEN IF RF HAS BEEN ADVISED OF THE POSSIBILITY OF SUCH DAMAGES) THAT ARISE IN CONNECTION WITH OR RESULT FROM YOUR USE OF OR INABILITY TO USE THE WEBSITE INCLUDING, BUT NOT LIMITED TO, YOUR RELIANCE ON ANY MATERIALS, CONTENT, INFORMATION, THIRD PARTY WEBSITES, OR SOFTWARE OBTAINED ON THE WEBSITE, OR MISTAKES, OMISSIONS, INTERRUPTIONS, COMMUNICATIONS FAILURE, DELETION OF FILES OR E-MAIL, ERRORS, DEFECTS, VIRUSES, TROJAN HORSES, DELAYS IN OPERATION OR TRANSMISSION, OR ANY FAILURE OF PERFORMANCE, OR THEFT, DESTRUCTION OR UNAUTHORIZED ACCESS TO YOUR RECORDS, PROGRAMS OR WEBSITES. To the extent permitted by law, you agree to defend, indemnify and hold harmless RF, its subsidiaries, affiliates, licensors, content providers, service providers, employees, agents, representatives, officers, directors, and contractors (the “Indemnified Parties”) from any breach of the Agreement by you, including any use of Website Content other than as expressly authorized in the Agreement. You agree that the Indemnified Parties will have no liability in connection with any such breach or unauthorized use, and you agree to indemnify any and all resulting loss, damages, judgments, awards, costs, expenses, and attorney’s fees of the Indemnified Parties arising out of or relating to your use of the Website. You also agree to indemnify and hold the Indemnified Parties harmless from and against any claims brought by third parties arising out of your use of the information accessed from the Website. RF may give notice to you by electronic mail, by a posting on the Website, or by conventional mail. Notice by RF shall be effective on the date that RF makes a good faith effort to reach you. You shall give notice to RF as stated below. Notice by you shall be effective on the date that RF actually receives the notice. Notice of change to your end-user registration information as referenced under Section 9 is to be done through your online RF Account Profile accessible via the Website or through the RF Portal. 16.1. This Agreement is personal to you, and you may not assign, transfer or delegate your rights or obligations to anyone. The Agreement shall be governed and interpreted pursuant to the laws of the State of Ohio, notwithstanding any principles of conflicts of law. You specifically consent to personal jurisdiction in Ohio in connection with any dispute between you and RF arising out of the Agreement or pertaining to the subject matter hereof. The parties to the Agreement each agree that the exclusive venue for any dispute between the parties arising out of the Agreement will be in the state and federal courts in Cleveland, Ohio. 16.2. You acknowledge that RF will be irreparably harmed by any breach of this Agreement by you or by your unauthorized use of the Website or Website Content and, further, that monetary damages may not be a sufficient remedy for such harm. You agree that RF shall be entitled, without waiving any other rights or remedies and without further demonstration of irreparable harm or the inadequacy of monetary damages, to obtain injunctive or other equitable relief in the event of any breach of this Agreement by you or by your unauthorized use of the Website or Website Content. 16.3. Except as otherwise provided in any pertinent non-disclosure or confidentiality agreement, this Agreement is the entire agreement between RF and you with respect to the Website. 16.4. Headings in this Agreement are for your convenience only and do not have any legal meaning or effect. 16.5. If RF waives or fails to enforce any term or condition of this Agreement on any one or more occasions, whether by conduct or otherwise, its waiver or failure to enforce will not mean that it must waive or cannot enforce such term or condition on any other occasion, or any other term or condition of this Agreement. The meaning of this Agreement cannot be changed by your or RF’s conduct, even if repeated, or by any custom or practice of others engaged in the same or similar businesses. 16.6. A printed version of the Agreement and of any notice given in electronic form shall be admissible in judicial or administrative proceedings based upon or relating to the Agreement to the same extent and subject to the same conditions as other business documents and records originally generated and maintained in printed form. 16.7. In the event that any provision of the Agreement is held to be invalid or unenforceable, pursuant to judicial decree or decision, the remainder of this Agreement shall remain valid and enforceable according to its terms.